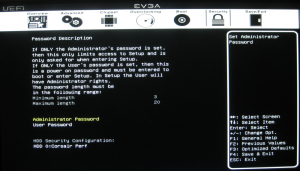 EVGA has been a player in the motherboard game for quite some time now. With Intel’s release of the Sandy Bridge-E CPU’s came with it another chipset, Patsburg (X79). They have again brought to the table its usual lineup for this platform, the SLI (E775), FTW (E777), and the Classified (E779). Today we will look at the formidable FTW and see how it stacks up in the crowded X79 motherboard landscape. 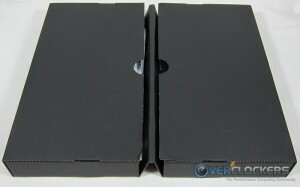 The first thing you would see on the store shelves when looking for this board would be this retail packaging. 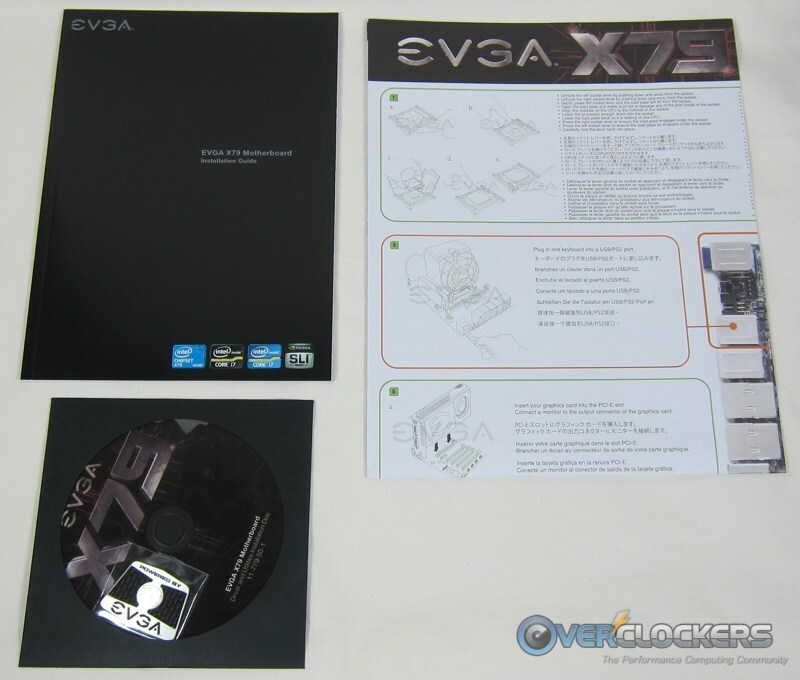 Like all retail packaging, EVGA notes some major features on the front such as USB3, SATA3/6GB, and PCIe3.0 ready. 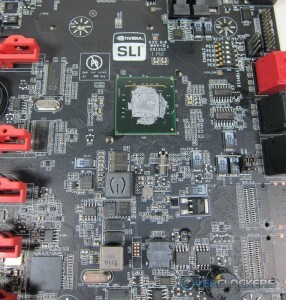 Flipping the box over shows a picture of the board, as well as some other key features and warranty information. The box is a bit larger than some lesser models as the there are many accessories included as well as the board having its own space below the accessories box. Opening up the box, you can see the accessories mentioned above having its own box as a partition separating itself from the board for safe keeping. Below are the accessories, manuals, and driver disk that came with the board. 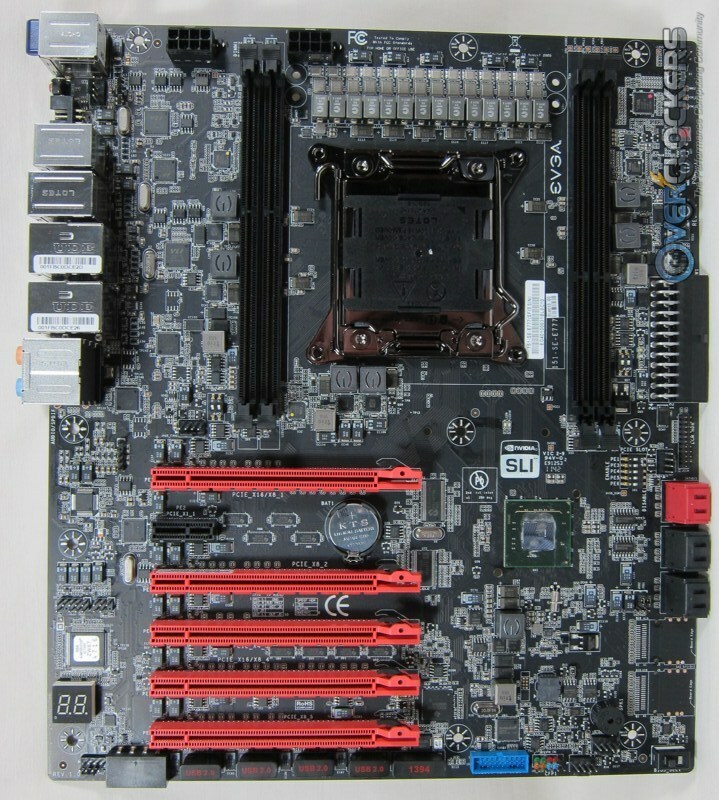 As is typical with most boards, you see a compliment of SLI Connectors (from single flexi to triple rigid), front panel USB3, rear panel USB2/eSATA, SATA cables, and the I/O plate. Blue-tooth connectivity is surprisingly, and pleasant I may add, not handled by a small 1x PCIe card, but a small unit on the rear I/O above the USB2 ports. 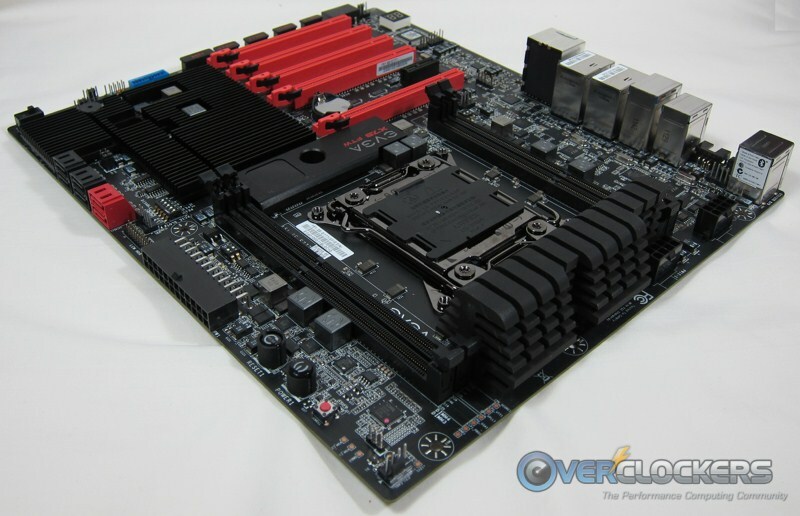 My first impression on seeing this board on the web was wow.. thank God they did not move from their black or black/red theme on the motherboards. Below, in my opinion, is one of the better looking boards on the market with its true black PCB, large black PWM heatsink, four black DIMM slots and a large flat black cooler for the PCH area and former Northbridge area which lights up the EVGA symbol with a red, slowly pulsing glow. You can see from the alternate angle this board is equipped with some features expected from a board with a rich overclocking history such as power on/off buttons, reset CMOS button, and voltage read points. 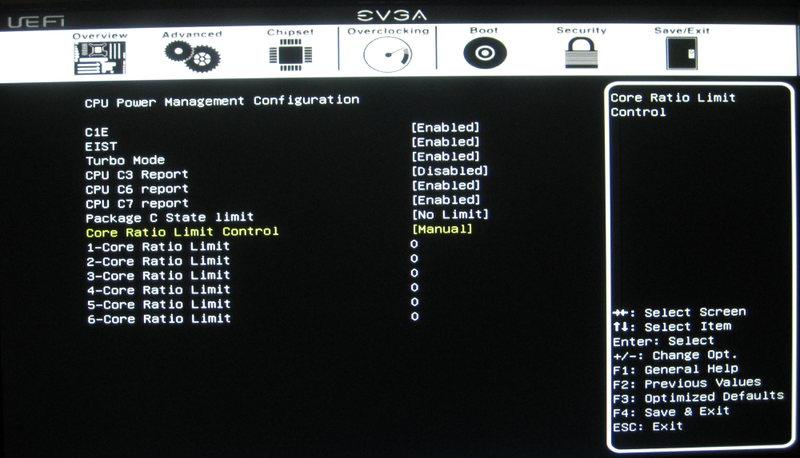 You may be able to see the switches for the PCIe lanes to enable/disable to aid in troubleshooting. 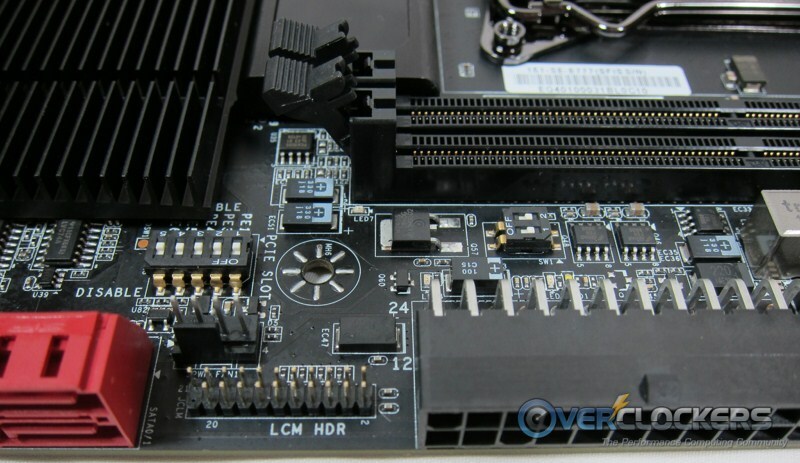 A couple of pretty cool features usually reserved for such high-end boards are onboard switches to help enable or disable PCIe slots (the five DIP switches on the left side). 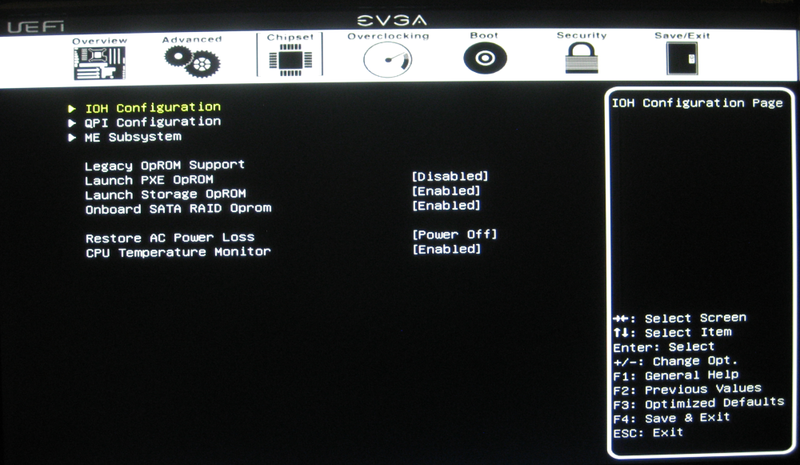 The EVGA FTW has provided those as well as something I have never seen before, switches to disable the DIMM slots. They state this is to ease troubleshooting the memory as you would not have to remove the DIMMs to do so. This would be especially helpful if the ram was under extreme cooling, and just plain old convenient otherwise. Also pictured below and slightly to the right of the PCIe switches is a mysterious ‘Command Center Port’ which will be ‘…available for power users later’. 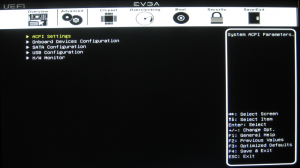 I’m not sure what exactly this will bring considering EVGA already has the Evbot, but I’m really curious! A very quick mention since its pictured clearly here is the 24-pin power connector for the board and its orientation. 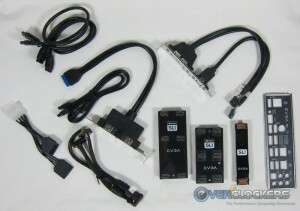 Yeah, EVGA flipped it 90 degrees so you do not have to torque on that garden hosed size power lead coming from your PSU. This should help a bit with cable management for those putting this board inside a case. Another typical feature for most high(er) end boards are the power/reset/cmos switches which imply use on open benching stations so as not to ‘short out’ the front panel connections for power and reset. The power button glows a nice red when powered on, and the reset button actually doubles as a HDD activity light. I find that addition to be huge when wondering the the PC is even thinking about doing anything when taking a while to boot. The voltage read points show the typical Vcore, Vtt, VccSA, PLL (right), and has separate read points for the DIMM’s (bottom right) since they are essentially setup as two units. So lets strip this board down of all the heatsinks and show whats going on under the hood. Notice the large row of VRM’s just north of the CPU? That screams potential to me. 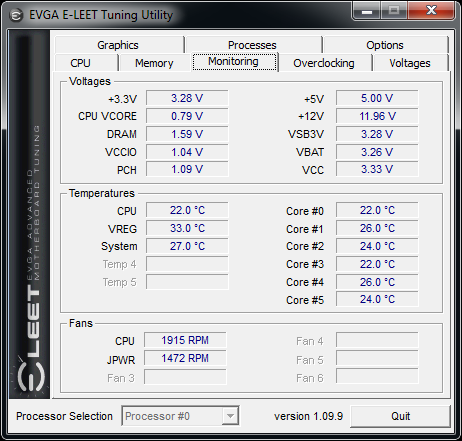 And knowing this platform, it also screams that it needs cooled when overclocking heavily. Good thing the heatsink in that area is pretty large. Notice the two 8-pin CPU power plugs? Something has to give that row of VRM’s power! How about the (typical) gratuitous use of Thermal Interface Material (TIM) on the PCH chip? Ok that may sound a bit negative in a sea of positives, but figured it was worth a mention. 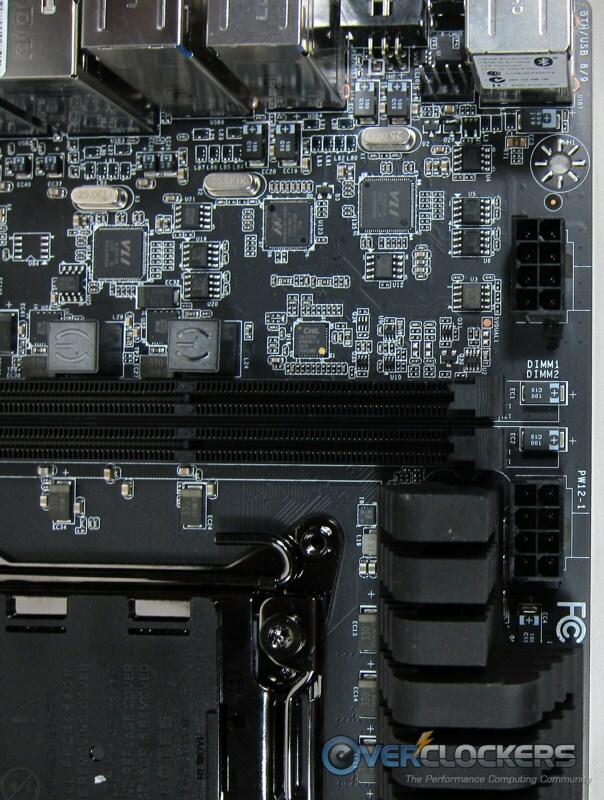 First we can take a closer look at the power delivery area sitting just above the CPU (and below the board). I don’t think this board will have any trouble feeding Sandy Bridge – E (SNB-E) all the juice it needs with its 12+2 configuration. 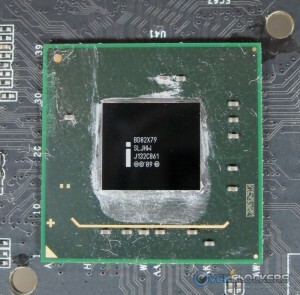 Again, remember the two 8-pin CPU power plugs to the North and Northwest of the CPU (only one pictured below). I saw a post on a different forum from TiN stating that one can be left unpopulated until around 5.2Ghz+/1.6v, then both plugs should be used. My favorite descriptor comes in to play here in regard to the power delivery section, robust. As with most X79 boards, active cooling should be used when overclocking to aid in system stability and pushing to the limit. Moving on down the board to the exposed PCH area, you can see again the TIM application from the factory was pretty liberal. The heatsink only appears to make contact with the PCH chip only. Second is the chip all cleaned up, and close up. 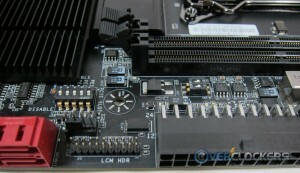 The last picture for this section shows the heatsinks. No fancy guns, no heatpipes, just a heatsink. I do like the passive PCH heatsink which keeps the noise down versus active cooling solutions. Pictured below are controllers for the USB (Asmedia, USB3) and controller hub (VLI – 4 ports each), as well as the Marvell controller (SATA). There are two of the Chil power controller chips, one for each set of DIMMs, which is the reason you will see in the bios two separate voltages for the DIMMs. Taking a look at the rear I/O area of the board, starting from left to right, is the blue tooth adapter, 2 USB2 ports, CMOS reset switch, Evbot port, PS/2 port, 2 eSATA ports, 2 1GB NICs, the sound area with an optical out, and a total of 8 USB3 ports spread across the panel. About the only thing missing here is the kitchen sink. 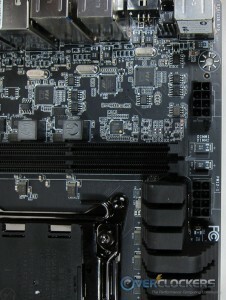 You can see the 6 SATA ports available (2 SATA3 6/GB, 4 SATA2 3/GB) in the second shot. 2 Intel and 4 from Marvell. 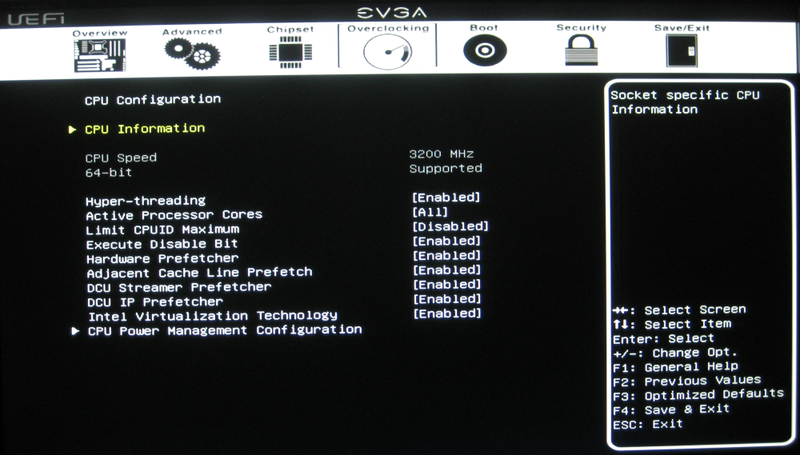 Listed below are the high level specifications for the EVGA FTW. Product Warranty This product comes with a 3 year limited warranty. Registration is recommended. 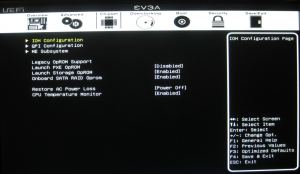 I was excited to hear that EVGA has gone to a UEFI BIOS on X79. I was expecting, like its high-end competition, to have a really nice GUI on it. I have to admit however, I was a bit disappointed. No fancy pictures, or colors, just plain old black and white with yellow being the highlighted or selected color. Maybe with Z77 we will see it all dolled up, who knows. This does not take away from its functionality of course, and some may even prefer this appearance over the prettied up GUI’s. Maneuvering around the bios was quite easy and unlike other boards with the fancy interface, there was no delay in trying to manually type in numbers. Basic UEFI interface aside, the latest bios (32) has turned in to a pretty solid one after the few previous ones for my setup had some (significant) issues in my testing. 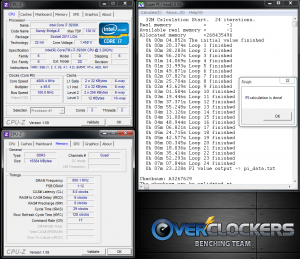 Memory timings wouldn’t save or save incorrectly, overclocking past 4.5Ghz or so was more difficult to find stable and tend to require more voltage than other boards. But with the newer releases (30 and up), most of those issues have been resolved. The only problem I am having now is with a specific set of memory, so I am chalking that up to incompatibility, and hopefully another bios release will let these 2133Mhz sticks work in that board. But the quad channel DDR3 1600Mhz kit now works like a champ in this board. 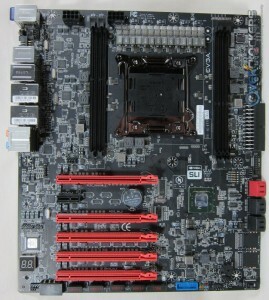 Another great feature on this board is the ability for it to hold/use three Bios’. You can corrupt two of them and still have an extra to flash them both back. This is accomplished by a switch on the bottom right hand side of the board. In order to flash the alternate bios’ one would boot to a functional bios, then flip the switch to the bios you want to flash, and flash away. The method I used was in windows and it worked flawlessly every time… and trust me I flashed A LOT. The earlier bios’ that came with this board had a terrible debug 67 code lock when pushing the memory or even high overclocks. It was such a hard lock in fact that you either, A- had to remove sticks of memory and then flash the CMOS, or B- reflash the bios itself. 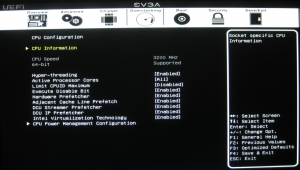 Thankfully EVGA has been diligently working on their bios’ and the latest release, 32, has improved things dramatically from the version that came with the board. Look at the actual bios below, you can see its not quite as pretty as the other UEFI bios available from others. That doesn’t at all take away from its effectiveness however. Some people prefer the new look others, like their trusty blue, or in this case, black and white bios. 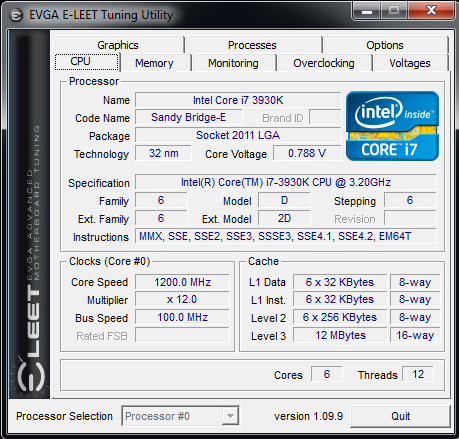 The Overview shows high level statuses of CPU speeds, voltages, and temperatures, and some fan speeds (not pictured). Moving over to the left on the top menu bar to Advanced, you can see the options to change ACPI settings, Onboard devices such as NIC, Audio, USB3 ports, firewire port, to enable or disable these features. Digging deeper in this section to the H/W monitor area, it shows CPU/Vreg/System temps as well as all the fan header speeds/settings. Continuing to slide to the right, we have the Chipset option. Underneath this you can control IOH configs, QPI config, ME subsytem as well as enabling/disabling the CPU temperature monitor. If this is disabled, the debug LED will not show the temperature, but that FF post code. I prefer to leave it on the temperature setting. Now the part I’m sure everyone web wheeled down to, the Overclocking section (upper left below). In this area is where you control all of the overclocking functions on the board. 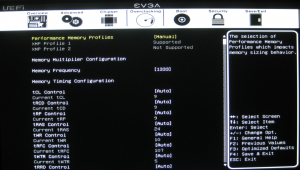 In the main screen you see options to change Memory configuration, CPU configuration, Bclk configuration, as well as being able to change all the major voltages. Drilling down in the Memory configuration (top right below) it has options for all the major timings, several sub-timings, and (not pictured) are things I have never seen before in memory. Remember that X79 supports XMP1.3 profiles and is generally what will work best on this platform are XMP1.3 enabled sticks. In the CPU Advanced features area (bottom left) is where you enable/disable hyperthreading and cores among other items. 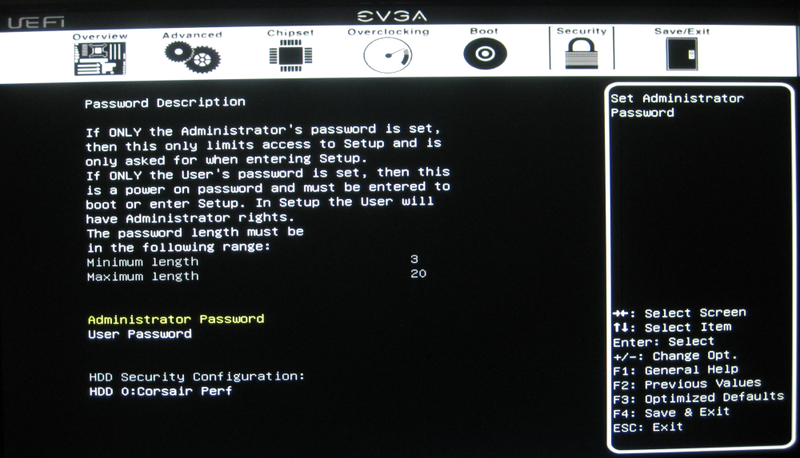 Inside this menu is the CPU Power Management Configuration section (bottom right). Once inside this you can see the power saving features, turbo mode, and manual adjustment of each core for turbo. Turbo MUST be enabled here to overclock. Last up are the Boot and Security headers. 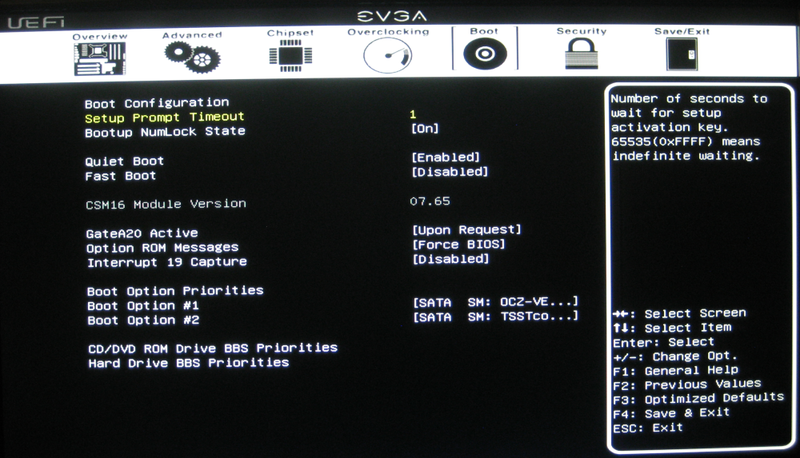 Not too much to say here as all the options one needs to switch/override boot priority are available and quite frankly, I never use any board security functions, but they are there if needed. One thing that you may notice is missing in all of this is the power limits that most boards have. These features were available in older bios, but with newer releases they are gone. I’m not sure if there is no limit, or just a high enough one that users do not have to worry about it. I’m actually thankful these are gone as the way they were worded was incredibly confusing to me. It said something like “1/8” watt power limit… I was never sure if it was 1/8 the value you entered or not, but its gone now, so no worries there. It was a peculiar naming convention, that is for sure. One other item to note in this bios which isnt a big deal but certainly a departure from the norm is the F4 to save and exit the bios. I don’t know about you guys, but F10 is save and exit. Of course, its not a big deal, but something worth mentioning. EVGA has their own product aptly named ELeet. This tool has been around since at least the P55 days and hasn’t really changed much since then. Recently they have added a splash screen upon start up, as well as supporting the new chipset of course. I had a bit of trouble using the utility with a couple of bios, but with recent releases, that has since gone away and is a great utility to make adjustments from within windows. You see the familiar CPUz front end (and there is a back-end submission for validation button on the Options tab) and memory tabs. Eleet goes a step further here with a monitoring tab showing all the most important voltages and as well as temperatures including the voltage regulators and fan speeds. 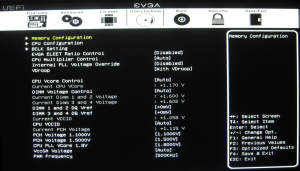 As with any software, sometimes the voltages are not so accurate, so if possible, use a Digital Multi Meter at the voltage read points on the motherboard to get the most accurate number. Surprisingly however, outside of Vcore, it was accurate within .02v. The Vcore was almost .05v volts off on the low side (load) of the software reading. 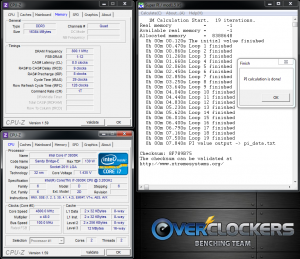 For windows based overclocking, your basics are covered with BCLK, and multipliers. Moving on to the voltage side of the house you can see everything needed is available including VccIO, VccSA, DIMMs/DQ VRef, and of course Vcore. With the latest version, they added on a splash screen so at least you know its thinking about starting when you are pushing the limits. Prior to that, due to the applications load time (around 5-10 seconds), I found myself wondering for a few seconds if it froze, or if I even double clicked it properly. That said the application does its job. Well, after some better bios’s were released I found getting up to what appears to be the CPU’s ambient limit of 4.8ghz was pretty easy. It of course helps that I have a bit more experience under my belt and knowledge of the chip, but that shouldn’t take away from this board actually benchmarking just the same at this speed. In the UD7 review I completed, the voltages used were a bit higher for these tests as well, especially in the multi-threaded benchmarks. Again one could say this is a function of knowing the CPU better, and that has a bit to do with it, however I dropped the CPU back in the other board and found very similar, higher voltages required for for the same clockspeed. As was noted earlier I am still having trouble with the memory I have (GSkill RipjawsX 2133 CL7) even posting past 1600Mhz, but other, quad channel kits are having no issue with its stock speed of 1600Mhz, and overclocking those to 1866Mhz. So again, looks like its a memory compatibility issue with those specific sticks as others work past 1600Mhz. 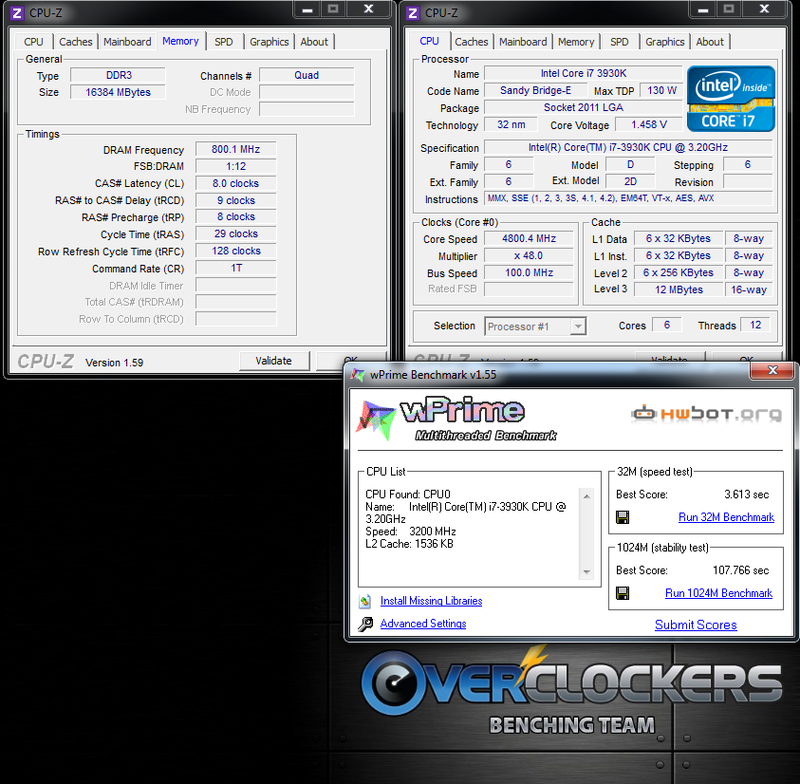 As you can see from the overclock results below, I was able to knock out 4.8Ghz with all the CPU based benchmarks below. This compares, with both clockspeed and results, with the other boards I tested. At the time of publishing, I was not able to take it cold yet to see if it could beat my 5.3Ghz I achieved…I will update in the comments section once that is done. I have no worries this board will take it there, and possibly further so long as the power limits that were removed are set high enough or taken out all together in the background. I have to admit I’m personally a bit soured on the entire X79 platform at this point in time. There really wasn’t one board in my hands that worked perfectly out of the box. I was having overclocking issues, or memory issues, or both for that matter. Though I’m well aware these are natural growing pains with new platforms, its still frustrating to deal with. As time went on for each of these boards, things did improve and I wouldn’t stray from the platform if I needed, ok wanted, all this horsepower. 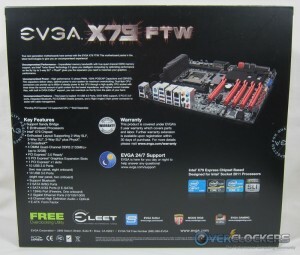 My experience with the EVGA X79 FTW was no different, but admittedly better than some boards. I can say the support efforts to get the bugs out has been top notch. 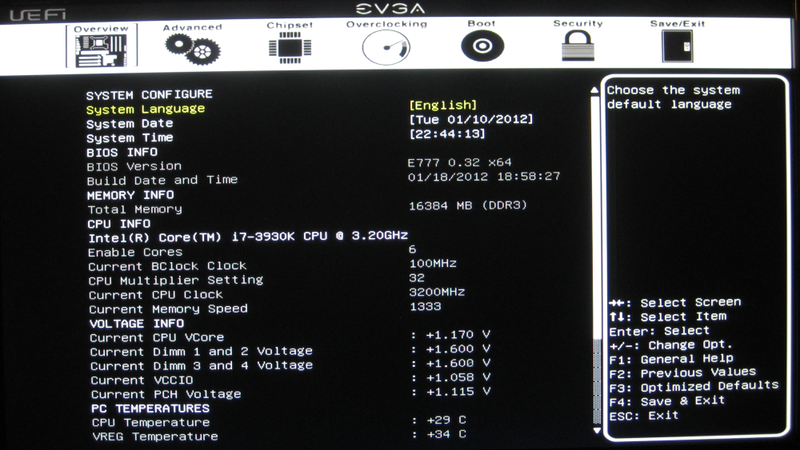 So when you go out and purchase this board, be sure to go to EVGA’s website and download the latest bios. With that being said, the latest couple of bios releases really helped knock out some of the issues I and others had with this board as far as memory overclocking/compatibility and overclocking in general. As time goes on and more bios’s are released, things should continue to improve for the board and platform in general. 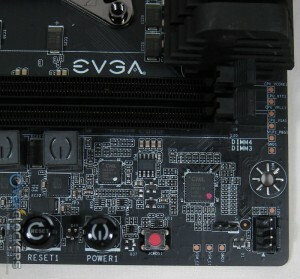 Negative points aside, you have, per usual from EVGA in my opinion, are very sharp looking boards with its true black PCB, red PCIe slots, and overall appearance. Being able to troubleshoot both your GPUs and DIMMs via DIP switches on the board make doing so while extreme overclocking much easier as you do not have to swap out the parts to see which one went bad. The FTW has what overclockers need to get the job done. The FTW has what extreme overclockers need to get the job done. This board can simply get the job done for those wanting to spend the money ($389.99 + SH @ newegg.com) to jump up to the monster X79 platform. Nice review Joe:thup:, I share your sentiments around the X79 boards being not run-ready, except for the RIVE (and MSI Xpower II) I tried most of them have issue out of the box. You're quite welcome. It was fun to do, this is a great looking board. Thats good news... In initial bios they had some odd settings (as in nomenclature, something about 1/8A and 1/8W) but after the initial shipping bios, it disappeared. But this review missed out on a serious design flaw in EVGA's X79 motherboards - all of them. It is that they only support 32 lanes of PCI-E bandwidth, not the 40 lanes that all other X79 boards support (even the cheap $210 ones!). As a matter of fact, it seems this review completely skipped over any type of GPU performance with this board. Why is this a problem? For the 99% out there that have 2 or even 3 GPUs, this won't phase them what so ever. Even with the latency of the X58 chipsets of the PCI-E buses removed in the Sandy Bridge P67/Z68 chipsets, and now the X79, it's faster than we've seen before! Yeah, they are fine with 3 or even 4 GPUs with their single montior and this board. Absolutely great game play! 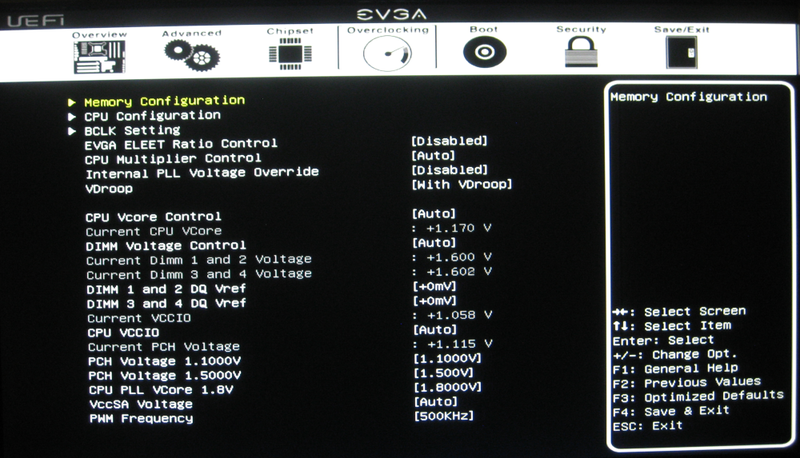 Well, it's those 0.05% of people out there with 3 displays that are all pissed off here with EVGA. It is proven at Toms Hardware (and now with the X79) that "Only super-high resolutions are affected by x8 lanes". Well, guess what those of us with 3 monitors with 2D Vision and 3D Vision Surround have? A resolution of nearly twice that of the 30" large displays: 5760x1080 resolutions. I'm still in the middle of building my X79 Asus RIVE system, of which I will test once and for all the difference of x16-x16-x8 and x16-x8-x8 by installing a dummy card in the 4th slot to downgrade the 2nd x16 slot to x8. I suspect this is where my 'stuttering' came from during high frame rates in the system I had (3-way 580s on X58 platform, x16-x8-x8). I'll also test x16-x16 and x16-x8 modes as well. 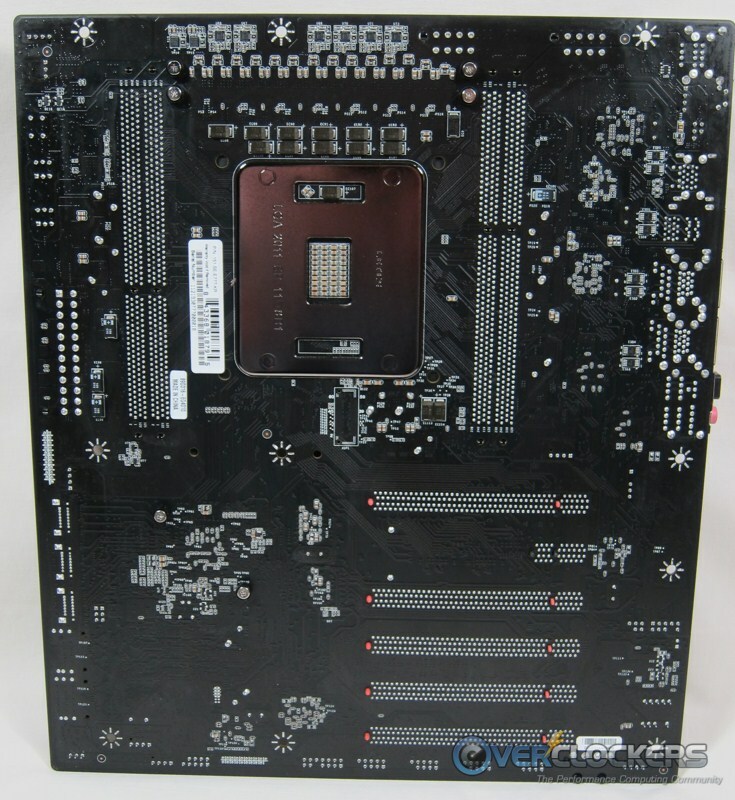 Also, it seems this review skipped over some of the other issues with this board, such as the placement of those dip switches in regards to a large dual-slot GPU that would block those dip switches, making it hard to get to. And the fact that this board is overly priced compared to what little you get. And lastly, EVGA had QA issues with these boards being shipped with no CPU cover, which voids the warranty. 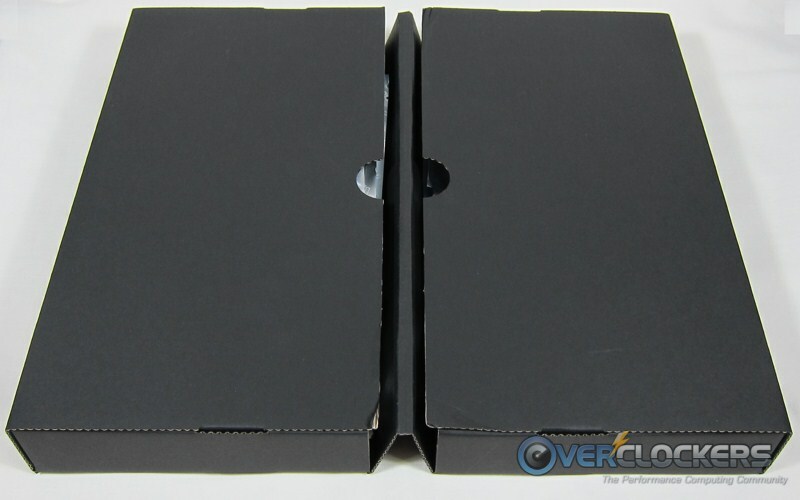 After removing the shrinkwrap to inspect my X79 for the missing CPU cover, and returning it unopened (only the shrinkwrap removed), I was promptly charged a $60 "restocking fee" as well - for removing the shrink wrapping of the outside of the box, to make sure the motherboard did not have THEIR QA flaw! 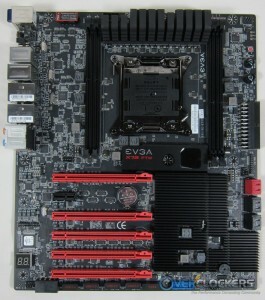 Yeah, EVGA left a bad taste in my mouth for the first, and last, motherboard I bought of theirs. I am posting to make sure others are aware as well. EVGA is a great American company and I'll continue to buy into their GPUs. Nice job on the review m8. Looks like a lot of issues with it, similar to what I saw when I reviewed P67 FTW. They still havent figured out how to get USB 3.0 to work on that board! 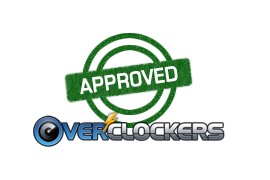 *Overclockers.com, at this point in time, does not review GPU performance on motherboards. Does any site do this? *The issue you found is significant for a rare few and is an apparent oversight on my part. I did not see that thread at Evga, but now in thinking about it, I remember something you posted here. I recall you saying they lied about their setup but it was clear on the website (again IIRC) and at newegg that there were only the 32 lanes available for w/e reason. 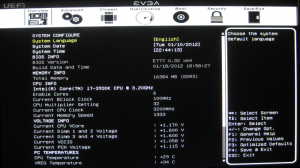 So though you may be correct, EVGA didnt mislead anyone it seems by the listed specs. The CSR you dealt with however, is another story. So I understand the frustration your personally have. The part that I am most disappointed in is the lack of an explanation from EVGA on why it isnt utilizing all lanes. *A GPU of any size (does not matter if dual/tri sized would be partially on top of the DIP switches. Its length covers it not width as a single slot cooler would cover it just the same a dual/triple. Which, for the record, only the 5th switch has something on top of it. That said, I had no trouble reaching it with a screwdriver with a full sized GPU on it, which with my hands, I had to do anyway to switch them around as they are pretty small. 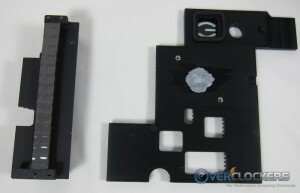 Other companies use larger switches and they are easier to flip and better positioned. It was essentially a non issue to me however. I can see how some would want larger switches. *As far as the QA problems and no CPU cover, this didnt happen with my sample, nor have I seen a mention of it on forums. I didnt look for it either... and maybe I should have. Maybe. This seems like an oversight with QA I suppose, but who knows how many people it happened to? My sample arrived OK. Sorry you got charged for that, it doesnt seem right and I certainly would have fought that issue. Its been a while since I bought any mobo through a store.. I had no idea they shrink wrapped boards. * The bios is now fixed, so how I can fault them outside of what was mentioned several times in the article? Every other company outside of maybe Asus and the RIVE had significant bios/board issues too and were dinged accordingly for it. This was no different than the rest IMO. They state it was the design of the product. 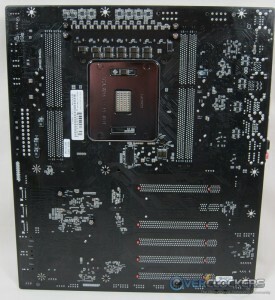 I'm hoping their next LGA2011 socket that supports the Ivy Bridge-E chipset will support all 40+ lanes. *As far as the QA problems and no CPU cover, this didnt happen with my sample, nor have I seen a mention of it on forums. I didnt look for it either... and maybe I should have. Maybe. This seems like an oversight with QA I suppose, but who knows how many people it happened to? It seemed to only the first batch or two that they shipped. My sample arrived OK. Sorry you got charged for that, it doesnt seem right and I certainly would have fought that issue. Its been a while since I bought any mobo through a store.. I had no idea they shrink wrapped boards. As of this moment, EVGA has contacted me and resolved the issue completely. :shock: Yeah, their support does rule over any company I've used. This review is not a real honest one. The conclusion also tells me that the reviewer was trying to make the EVGA X79 MB look good, when in fact it is a poorly developed MB that has many problems and could never come close to competing with ASUS, Gigabyte, ASRock, and MSi. Have reason to believe this review was setup by EVGA (Maybe EVGA through a little money at someone?). Why? EVGA is having serious issues when it comes to MB sales. Someone needs to tell EVGA if they want to increase sales, then they should make an MB that actually works right. The EVGA X79 MBs are having all kind of weird reliability problems. Way too many! 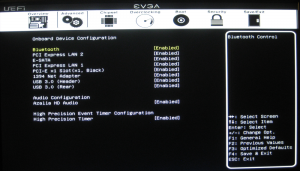 Just visit the EVGA forums and see all the problems the EVGA X79 line-up of MBs have. EVGA even shipped MBs with missing parts and QC tags still attached to them, some even came with bent pins. 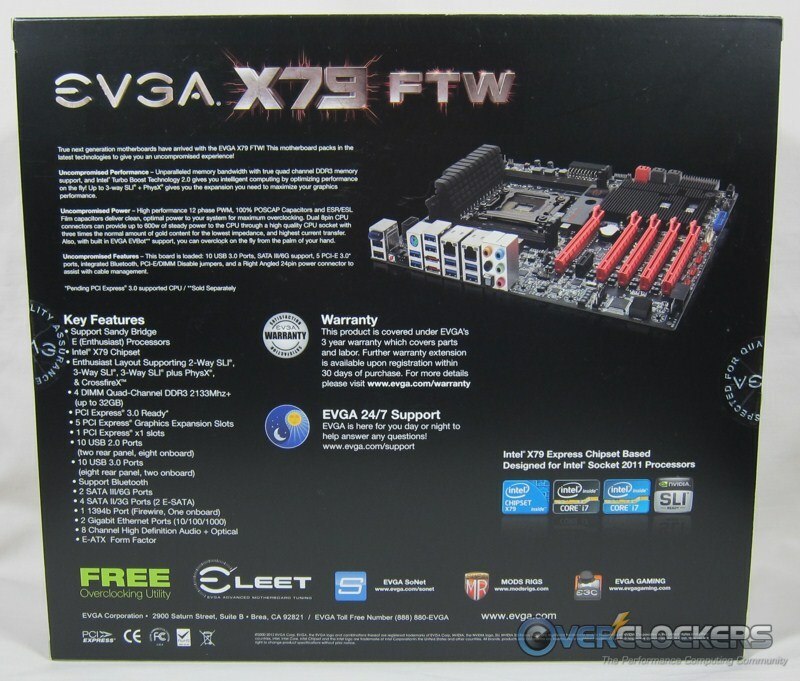 It would be gratefully appreciated if Overclock.com removed the EVGA X79 review and replaced it with a more honest one. 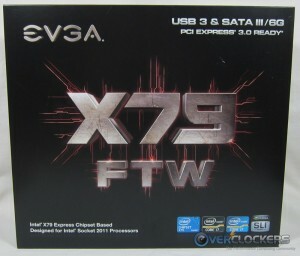 Because there is know way a good reviewer would recommend the EVGA X79 MBs in there current form/function-able state! 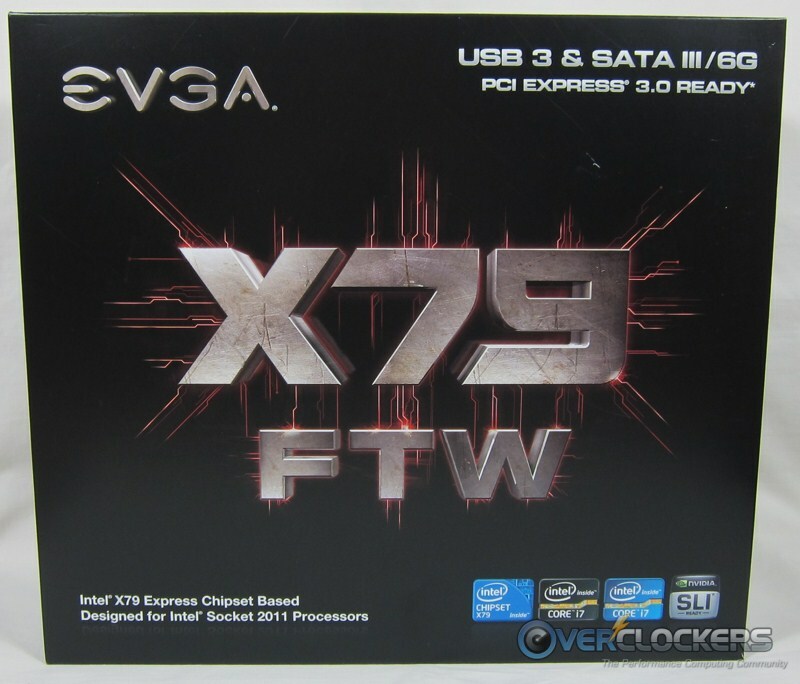 The conclusion also tells me that the reviewer was trying to make the EVGA X79 MB look good, when in fact it is a poorly develop MB that has many problems and could never come close to competing with ASUS, Gigabyte, ASRock, and MSi. Have reason to believe this review was setup by EVGA (Maybe EVGA through a little money at someone?). Why? EVGA is having serious issues when it comes to MB sales. Someone needs to tell EVGA if they want to increase sales, and then they should make an MB that actually works right. The EVGA X79 MBs are having all kind of weird reliability problems. Way too many! 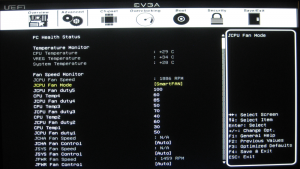 Just visit the EVGA forums and see all the problems the EVGA X79 line-up of MBs have. EVGA even ship MBs with missing parts and QC tags still attached to them, some even came with bent pins. Horsehead... Thank you for your input. I am the author. This review was in no way setup by EVGA outside of them sending us the motherboard to review, which is how ALL sites receive samples. I was completely honest in my assessment of the product and noted multiple problems with their PREVIOUS bios versions throughout the review. In no way what-so-ever was this influenced by the vendor. I stand 100% behind my assertion that with the latest bios release (32 and on) the board is stable and I experienced no problems outside of memory incompatibility (which happens with some sticks on all boards - for example, my Asrock Extreme4-M wouldnt run my quad ch sticks but ran my dual ch). I have seen some issues with boards at the EVGA site when writing the review. However I did not see a trend that wasnt fixed with a new bios (lots of memory issues like I reported) or reliability issues. 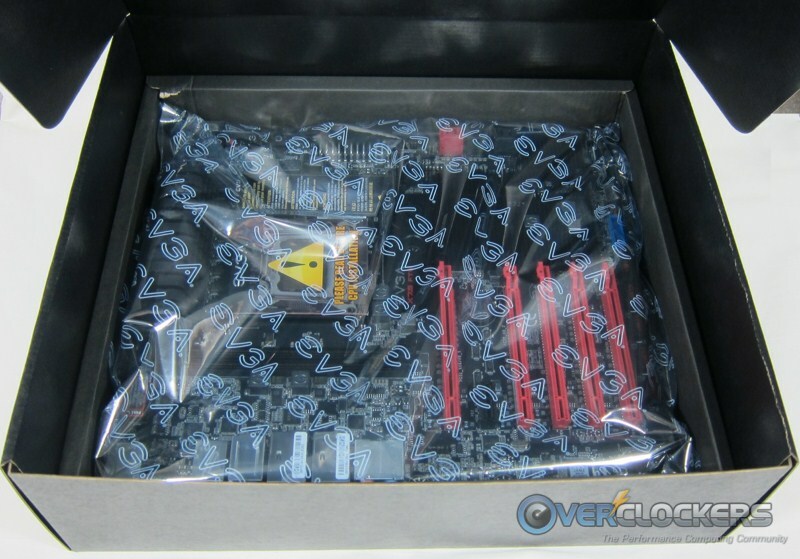 I will also mention I saw issues with Asrock boards, and Giga boards at their website too. No board is perfect and as is the norm, people go to forums for help with problems so you will always see more issues with boards on forums. Im sorry you are soured with these motherboards/EVGA. I will tell you in no way will this review be pulled as I stand behind my results and experience 100%. Have reason to believe this review was setup by EVGA (Maybe EVGA through a little money at someone?). ...needs to be addressed. You need to come up with some sort of proof or something to back up your claim or you need to move on and troll somewhere else. 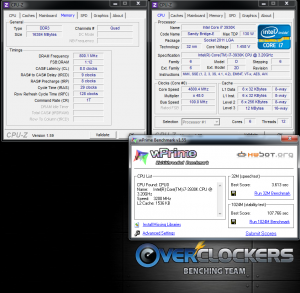 This is insulting to the author and to this site (which, by the way, is Overclockers.com, not Overclock.com). When you can properly say the name of our web site and speak without making baseless accusations, feel free to come back and post. You can complain about the quality of the review if you feel the urge. You can state your opinion on the board (it's plain to see you have an axe to grind), no problem. However, you may not come here accusing our authors of taking payouts. Come on man, listen to yourself. You really think EVGA would attempt to pay off a person/site to say moderately decent things about their motherboard? Perhaps you have a good recommendation where I can get some quality tin foil hats too? What if the same were said about you? Perhaps you were paid by another manufacturer to come and say that about the EVGA review. To any person with half a brain that sounds absurd, implausible and just plain ridiculous...which, sir, is exactly how you sound. 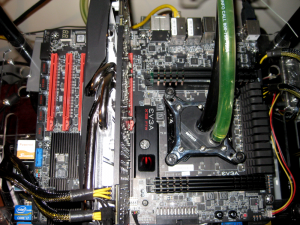 There is no difference between quad channel memory kits and dual channel memory kits. Hopefully you’re not one of those people that think you have to buy a 4 stick (Quad) pack over 2 dual or singles! Also, memory compatibility problems are normal (Not all memory options available will work in all MBs). EVGA's MBs have more than memory compatibility. 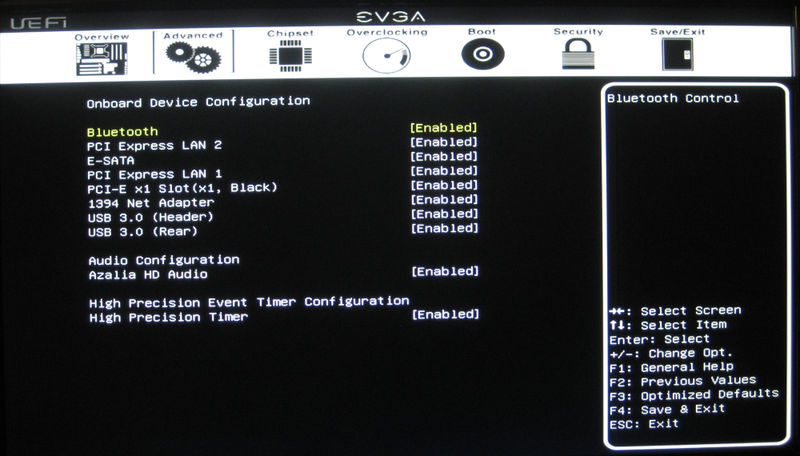 Also, the new EVGA BIOS that was just released has quite a few problems and has brought up a new USB surge problem and you still have to disable onboard options or not use those ports to get the MB stable. See, Gigabyte, MSi, and others have had problems, but they fixed them. 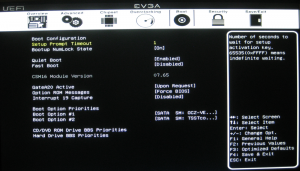 EVGA has done nothing but release half baked UEFI BIOS updates that just break something else. 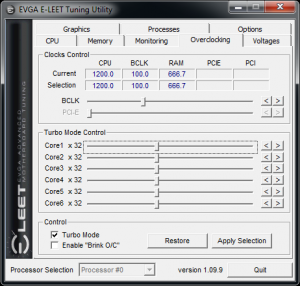 EVGA's x79 MB problems are continuous. ASRock, Gigabyte, and MSi problems are not continuous. Why don't you look around and see what the 1# X79 MB recommendations are from people and other review sites. The simple fact is your review is really bad. It is no better than a simple manufactures review of a new product. 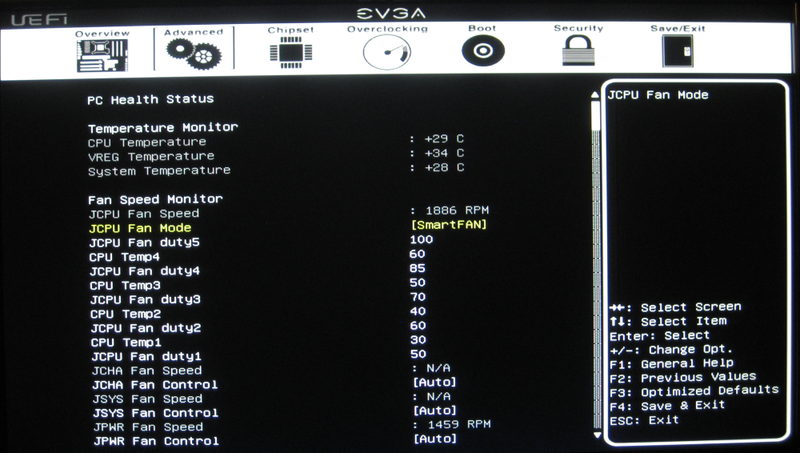 It is clear the EVGA X79 MBs are not ready for the main-stream and should be put on hold to the problems are solved. 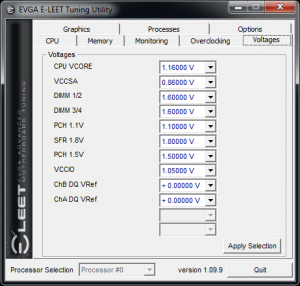 To make matters worse, EVGA will charge a restocking fee if you wish to return a defected MB. Even after receiving 3 MBs that all had the same problems and could not be solved by EVGA. EVGA is a nickel and dime company, they will blood you dry and kick you to the curve when you ask for a real solution, other than RMA’ing an MB every time a problem arises. Why didn’t EVGA send x79 MBs to a more than one site that would do a more in-depth review of the MB? ASUS, Gigabyte, ASRock, MSi and other seem to have no problem sending out multiple test samples and they do it before or at launch. Like I said (and is painfully obvious), you have an axe to grind. We get it, you don't like EVGA. You had bad experience(s) and want to tell the world. Fine, you've shared your two cents. You disagree with the review. You think the board is a fail, he does not. It's a disagreement, quit harping on it. Now that you've had your say, please cease insulting the reviewer. I also deleted your response to my post, which continues to accuse of payoffs. You've said your piece. Move on before you get yourself in trouble. Horse Head. I am really baffled at how/why you are lashing out at the reviewer here, in fact you are attacking all the reviewers and the site as a whole. Not sure what your real gripe is but you are one sad individual. You missed the point. 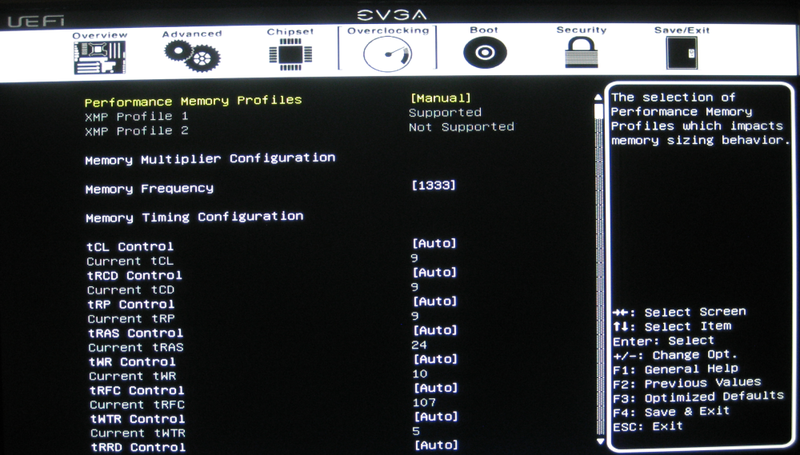 I was just noting memory incompatibility....across that EVGA board and others. 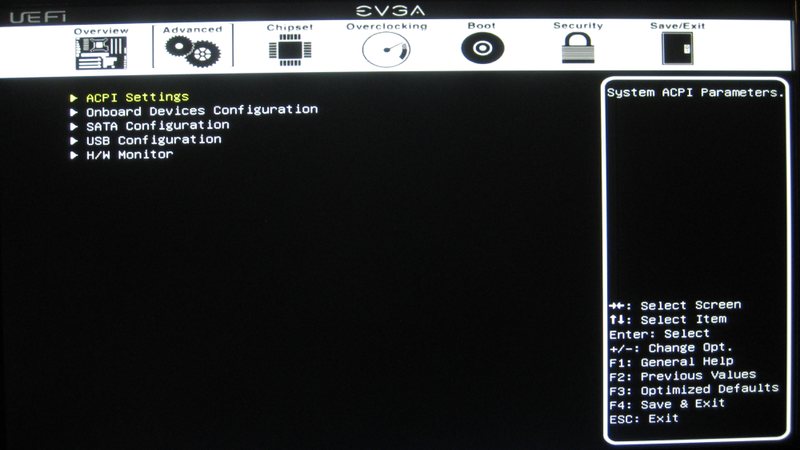 Also, the new EVGA BIOS that was just released has quite a few problems and has brought up a new USB surge problem and you still have disable onboard options or not use those ports to get the MB stable. I dont. And I use USB2 and USB3 devices... plugged in at 4.8Ghz for testing! With a USB KB/Mouse even! No signs of the ports dropping or spiking on this specific FTW. I did not mention that this was a preferred board over the same, just approved. The simple fact is your review is really bad. It is know better than a simple manufactures review of a new product. First, its 'no' not 'know' :rolleyes:. Second, I and many others disagree with your opinion on this review. Some did not like the price for what you get and I understand that. All I know is after a couple of bios' the board works 100% for me. 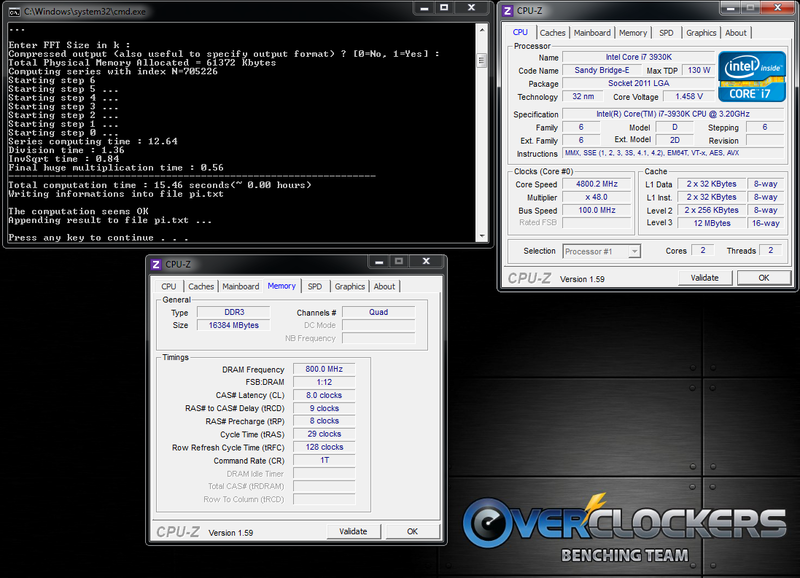 No bad USB ports, no overclocking issues (matched my giga! )...just a single memory compatibility problem, which again, is across all boards in some form or another. My sample and the bios I used is. That is my testing not what others have experienced. Its not a bios recall like gigabyte which is a WAY worse issue IMO. Or a board that NEVER worked and STILL doesnt work (its not even on the market anymore that I can see in fact). Now we finally have something we agree upon. EVGA shouldnt charge a restocking fee for a borked mobo. I see eduncan had a similar issue, but what is peculiar about that is no motherboards I know of are wrapped in shrink wrap when new so that story doesnt make sense. Not sure what to say here. I have never had to RMA an EVGA motherboard, they all worked fine. I guess I could care less about who is selling more boards. The fact is Asrock NOW makes some quality boards, and most of them are cheaper than the others. Most people worth a lick also dont NEED a board like this in the first place. Least we forget that they have around 6 boards in their lineup one of which starts UNDER $200...So its a cheap in to a very expensive platform. 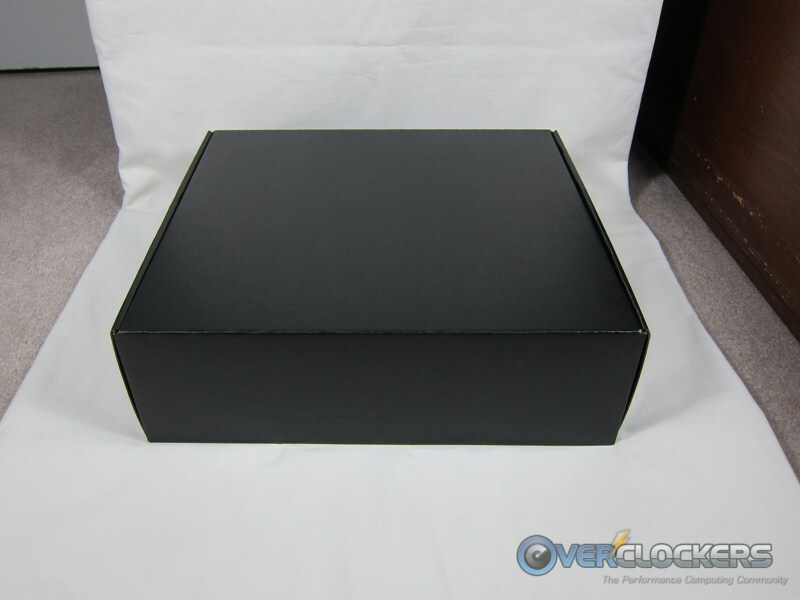 Face it, EVGA knows they got a brick! 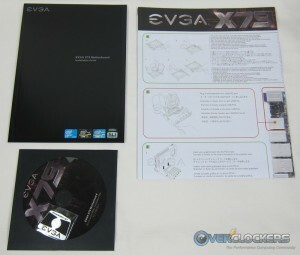 The ultimate paperweight is here, the EVGA X79 MB.